Well, that and killing the architect. And the construction workers who built it. That's the only way, for sure! 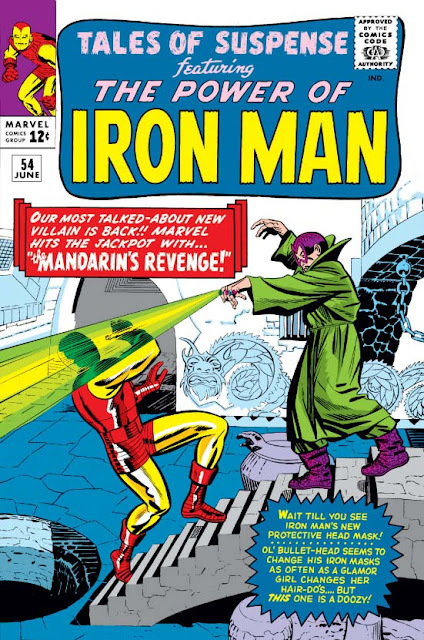 When writing about the Mandarin's debut, I noted that "there is something appropriate about Iron Man's archenemy being a product of the politics of the time, given that Iron Man himself came out of the Vietnam War." 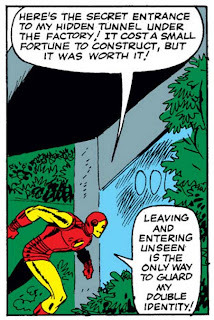 So in this issue it's doubly appropriate that before Iron Man tracks down the baddie in Red China, he first visits 'Nam to inspect the missiles his company has built for the US military (and specifically to find out why all of them are failing in action). It should be a momentous occasion, returning for the first time to the place where he nearly died and was instead reborn ... and yet, oddly, its significance as the site of his greatest creation isn't even mentioned. Fortunately, the country will be visited again in this very magazine in just seven months' time - yet, surprisingly, not by Iron Man...! Now with all-new "Jumping Monkey" power! Typically, what's perhaps the most intriguing development in this issue is something that takes just a few panels, and may have been little more than an afterthought to Stan. Before leaving town, Stark notices the growing tension between Pepper Potts and Happy Hogan, and so sends Happy on an inspection tour of Stark's other facilities to keep him occupied - an inspection Stark himself admits Happy is unqualified to perform. Later, Tony privately faces the fact that he sent Happy away because he noticed the chemistry brewing between Happy and Pepper, and was jealous. While this is the first sign of Stan actually moving the love triangle from a passive one (Happy loves Pepper / Pepper loves Tony / Tony's unconcerned) to an active one, what's even more interesting is how this deepens Tony into a more complex character. It was daring enough in the first place for Stan to have made his new hero a figure of the military-industrial complex - an institution which a significant portion of his readership was already inclined to hate and distrust - yet with this move we see our hero doing something unambiguously selfish, abusing his position of power and status over his employees, and getting away with it! 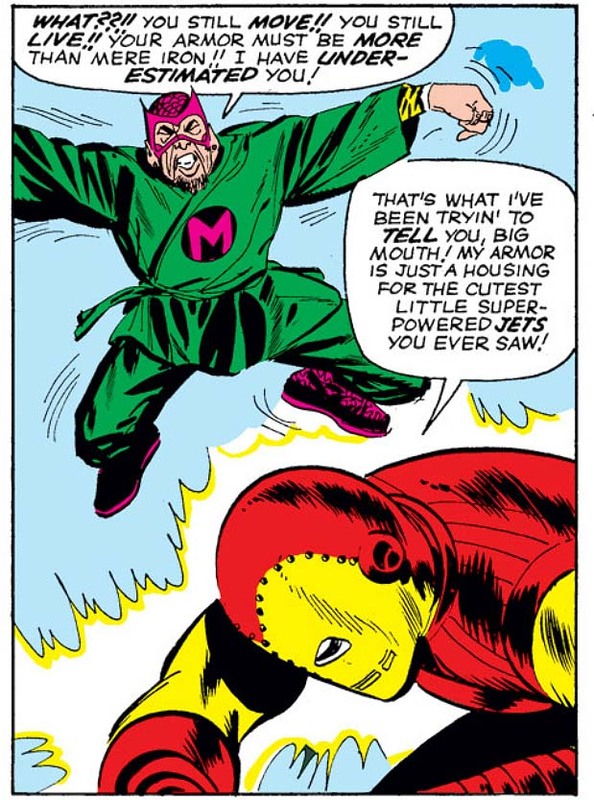 It's not glamorized, it's not defended, and Tony chastises himself for his weakness, but still: To a reader in the 1960s, seeing a hero do something that's clearly wrong (or, at the very least, "not right"), must have been a real shock. What a fantastic closing image! Meanwhile, in the backup tale... Man, I don't even know where to start! 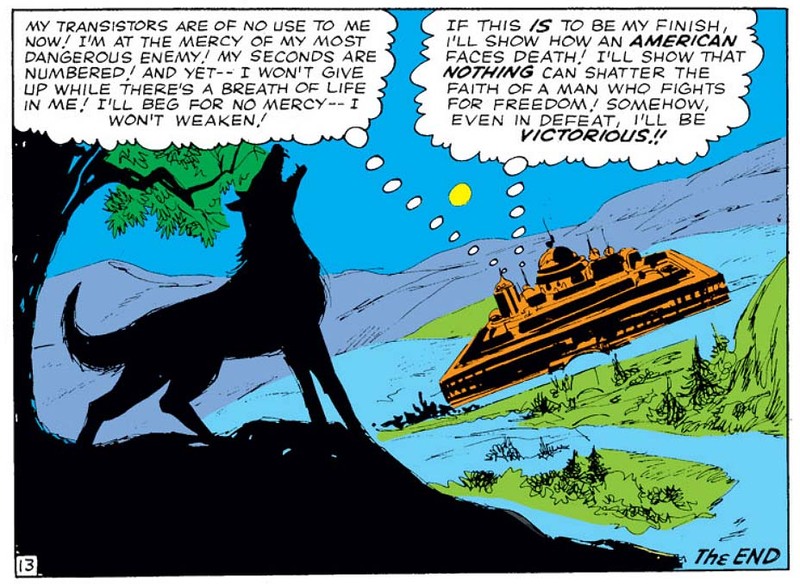 Okay, last issue we witnessed the origin of the Watchers, as they foolishly gave nuclear power to a society not yet advanced enough to use it responsibly, and in the wake of that world's destruction vowed never again to interfere with other races. An extreme reaction, but maybe it's justified, right? Well, in this second tale told in the aftermath of the first, the Watcher agonizes as he sees a radioactive space cloud (!) bearing down on an inhabited planet. Should he intervene? But no! He can't! What's he to do? He frets, and worries, and watches impotently ... until a nearby star suddenly goes nova and hurtles a dead planet into the path of the space cloud, the two dangers cancelling each other out in their mutual assured destruction. (By the way, that sound you just heard was my jaw shattering on the floor. As well as the story's credibility.) The lesson is clear: Had the Watcher interfered, the now-safe world would instead have been doomed. And yet, even beyond the nakedly contrived circumstances that so firmly yank us out of the story, the story fails in its goals by actually asking us to think about the idea at its heart: Are they seriously telling us that the lesson is "Don't get involved if you see someone in need of help"? That it's best to just let things take care of themselves? I mean, that's directly opposed to the moral - some might say comics' greatest moral - at the heart of the original Spider-Man tale: With great power comes great responsibility. Given the lesson here, what would have happened if Peter Parker had stopped the burglar that one, fateful night? Uncle Ben would have - well, gotten killed by a stray planetoid, I guess.